Here is part 2 of the Spring Mini - Click on the preview to download it. Love your work as always. you have to be my all time FAV designer!! Grabbed part one on FB yesterday and part 2 here today. All adding up to a lovely little kit, wonderful colour combination. Thank you so much for your generosity. thank you so much!!! =) you are so kind!! I've just downloaded some of your adorable freebies. I want to say a big thank you for your generosity!! I'll be checking out your store next. Thank you so much for this post. 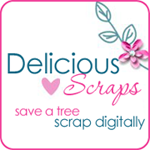 I want to let you know that I posted a link to your blog in CBH Digital Scrapbooking Freebies, under the Page 1 post on Mar. 21, 2011. Thanks again. Beautiful work as always. Thank you so much for sharing it with others. Have a great week. Thank you so much for sharing your wonderful kits with us. I appreciate your generousity! Wonderful colors! Definitely one of the best designs I've seen. Much thanks for this freebie. Hope you can do more stylish artwork. Kudos to you!